4 Bedroom, 3.5 Baths Near Cleaves Cove, Walker's Point across from Ocean. 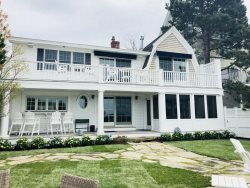 Spacious four bedroom three and a half bathroom updated home along Ocean Avenue in Kennebunkport. Located just a half mile walk from Walker's Point and steps from Cleaves Cove the private beach for the locals. Perfect location for walking, joggies and biking along Ocean Avenue or take a swim in the ocean at Cleaves Cove. A short 2 mile drive down Ocean Avenue to all the shopes and restaurants in Dock Square. Sit on the back patio with a fire listening to the waves crash in the ocean.